This is a high-quality, replacement Thermostat Assembly for the B7-A4 2.0T FSI motor. 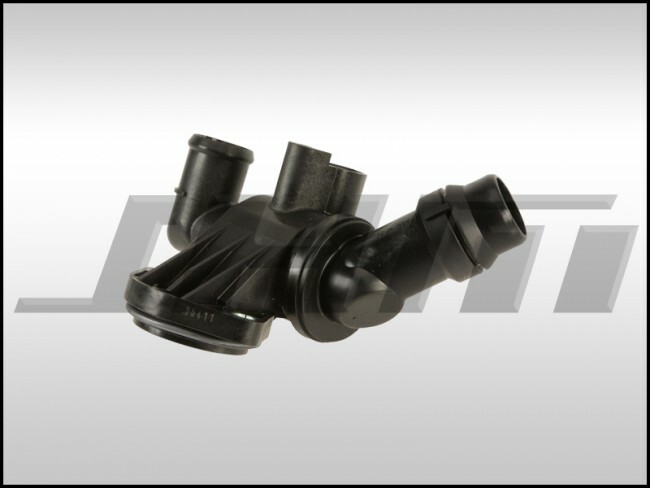 This piece is made by Wahler, and Original Equipment Manufacturer for many Audi-Volkswagen parts. NOTE: When replacing this thermostat it is highly recommended to replace the Heater Pipe O-ring (OEM PN = N90365302) that slips into the thermostat to prevent leaks. This is also available in this section of our store. Many overheating problems or problems where the coolant temperature will not get up to normal operating temperature can be traced back to a failing thermostat. For example, if your thermostat is stuck open, your car's coolant temperature may not warm up properly or even reach the specified temperature because the coolant is always being circulated through the system. If your thermostat is stuck closed, your car can overheat because the coolant NEVER goes through the coolant system. When replacing your thermostat, make sure you have extra G12 Coolant in case of spillage. You can purchase Coolant from our site in the Fluids Section.